I have been wanting to try out a fantastic Maple Glazed Pecan recipe by My Whole Food Life. I added all the ingredients plus a tablespoon of cinnamon and in 2 hours we had hot, sweet pecans! Now I could have simply eaten the whole batch by the handful – but refrained and cooked some almond flour pancakes instead! Almond Flour is a great grain-free alternative to regular flour (not something to consume daily but great substitute for the odd sweet treat or to crumb fish and meat). It also has a softer consistency than coconut flour which is great for baked goods. I saw a recipe ages ago but I can’t remember where so I just threw these ingredients in and it worked (sometimes I get lucky). 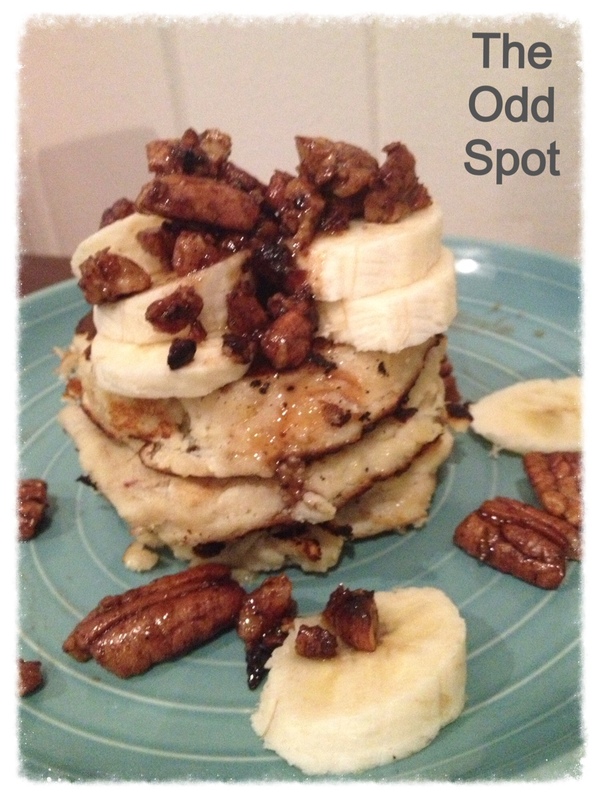 Throw the nuts on top of the pancakes serve with some maple syrup and sliced banana and you have a delicious (naughty) Monday morning breakfast! Umm put in the slow-cooker and cook for 1-3 hours, stirring often until your house smells amazing! Eat while hot and allow any remaining to completely cool before sealing in an air-tight glass jar. 1. Whisk eggs, milk, vanilla and maple syrup. 2. Add flour and baking soda slowly, stirring well until smooth. 2. Add a little coconut oil to a fry pan and cook on low-med heat in batches with only 2 heaped tablespoons of mixture per pancake (they are very delicate little things and burn easily so keep your eye on them). Next time I will be cooking up a side of bacon to add to the plate – maybe for Boxing day breakfast?? Just HAVE to share our Christmas Tree!